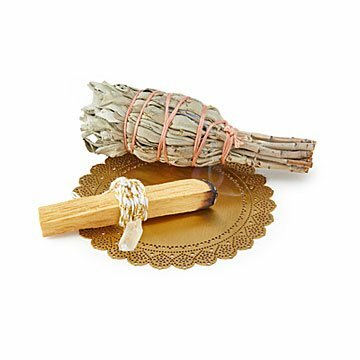 Burn this bundle of palo santo and sage to cleanse your space, or simply to fill it with an earthy scent. When you burn sage or palo santo, remember: You're embarking on rituals that are thousands of years old. Ariana Ost's beautiful bundle—complete with a crystal and mandala tray—was inspired by spiritual rituals practiced by some native populations (the Lakota and the Incas, for example). They believe that burning certain herbs and keeping crystals close wards off bad energy and allows positivity to fill your space. You might just enjoy the delightful, earthy scent, and bit of sparkle. Send the thoughtful, spirit-lifting gift to a new homeowner or a friend who could use some love. Handmade in New York City. Ariana Ost grew up in the jewelry industry, accompanying her father on business trips around the world. Learning to live and breathe jewelry gave her insight on how things get done. Paris is her life's passion, and anything French enchants her and inspires all of her designs. She went to Parsons School of Design both in NYC and Paris, and also took jewelry classes in London at Central Saint Martins to learn metal smithing and bench work. Ariana learned the ropes designing private label for seven years, becoming a 'jewelry psychologist' as she gained understanding of people's motivation to wear what they wear. This helped her to constantly renew and refresh her designs. Antique treasure hunting and sourcing the unexpected provided her with the confident conviction that creating anything is possible. Read a Q&A with Ariana on our blog. Sage, Palo Santo & Crystal Bundle: 4" L X 5" W X 2"H; Plate: 4" dia. Lay burning sticks and sage on the brass dish or on a fire resistant surface. When lit, do not leave the sticks unattended and keep them out of reach of children and pets. Beautiful product. Used it to smudge our 'new' 100 yr old home. Now, it sits near our fireplace on its metal plate and looks great.